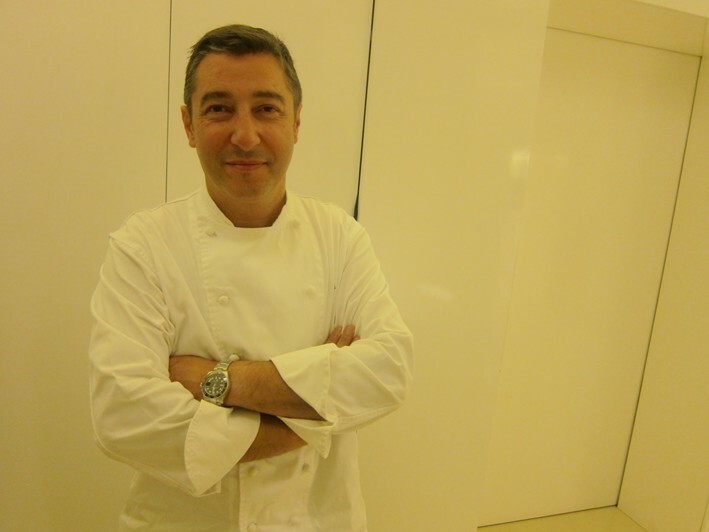 Celler de Can Roca is run by the three Roca brothers: eldest brother Joan Roca is head chef, Josep Roca is sommelier and Jordi Roca is the patissier. The restaurant is situated in the pleasant town of Girona, which has a well-preserved medieval old town and is about 60 miles north of Barcelona. 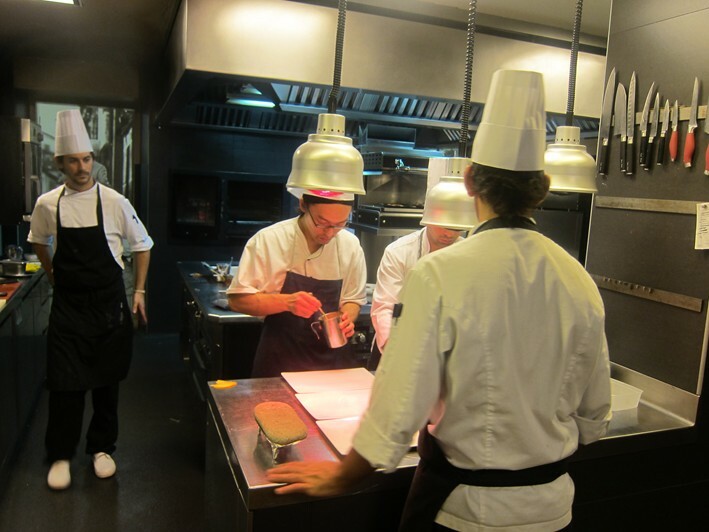 The restaurant opened in 1986 but moved to a purpose built new building in 2007, with large kitchens giving plenty of room for its 30 chefs to work. There is also a large temperature-controlled wine storage area at ground floor level to accommodate the vast wine cellar, of which more anon. The dining room is laid out in a triangular shape around an atrium with several poplar trees behind a glass partition. There is a wooden floor but each table rests on its own patch of brown carpet. The tables are well spaced and carefully lit, the restaurant accommodating around 48 diners at a sitting. There are wooden slats with back lighting forming one wall, a drop window facing the garden another side and a bar area making up the third side. The tables are set with crisp white linen and Rosenthal china. 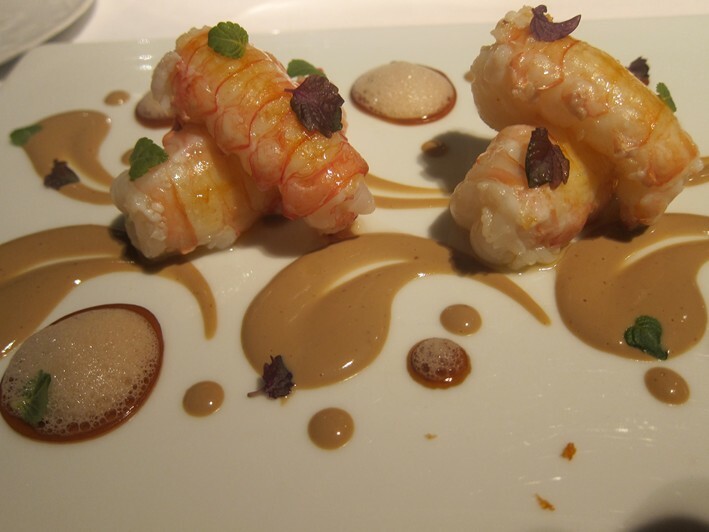 There are tasting menus at either 115 euros or 145 euros, as well as a la carte dishes. The restaurant is noted for its large wine selection, and the two huge wine lists, one for white and one for red, are mounted on their own trolley and wheeled to the table. 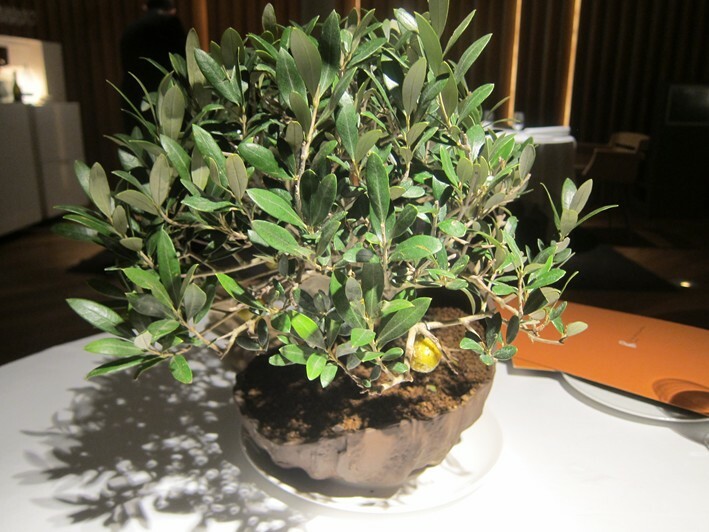 While you consider the wine lists a little bush arrives at the table, on which hang caramelised olives which you pick. Although this is an original presentation idea I found the sweet taste from the caramel a rather odd adjunct to the olives. The wine tomes stretch to 47 pages of white selections and 58 pages of red, with a range of no less than 2,800 separate wines available, with 60,000 bottles stored in the cellar area. This is split into five sections, in each of which is a video screen showing scenes from the wine area in question, and each with a decorative bowl with soil from the respective wine regions. The list is very kindly priced for anyone used to the mark-up levels in London or France. For example Alion 2000 was listed at just €64.80, and yet this would set you back €43 in a shop in London. Similarly, from the wide range of Vega Sicilia Unico vintages, the 2000 vintage was listed at €257 compared to a UK retail price of around €171, and the rare 1962 vintage at €540, yet this wine would cost you €389 in a shop in London if you could find it. Petrus 1982 was listed at €3,240, which is actually well below the €4,283 euros this wine costs in a London shop. We drank the superb Alion 2001, which is worth a brief diversion to discuss. Alion is the second wine of Vega Sicilia, whose Unico is one of the great wines of the world. Alion represents terrific value since although it typically costs a third of Unico, it is considerably more than a third as good. 2001 is a particularly good vintage to drink since no Unico was made that year due to frost, so all of the grapes that could be salvaged that would normally make Unico went into the Alion. 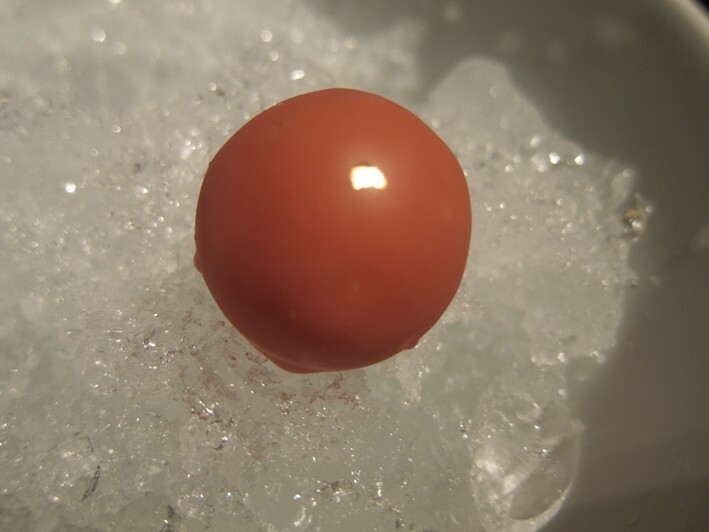 A little Bellini cocktail appeared in a chocolate sphere; this was lovely, the peach taste coming through very well (18/20). This came alongside a little blob of rich chicken mousse sandwiched in-between two very delicate slivers of fried potato (18/20). A further nibble was deep fried anchovy bone with rice tempura, which was tasty and was made with very delicate batter (18/20). 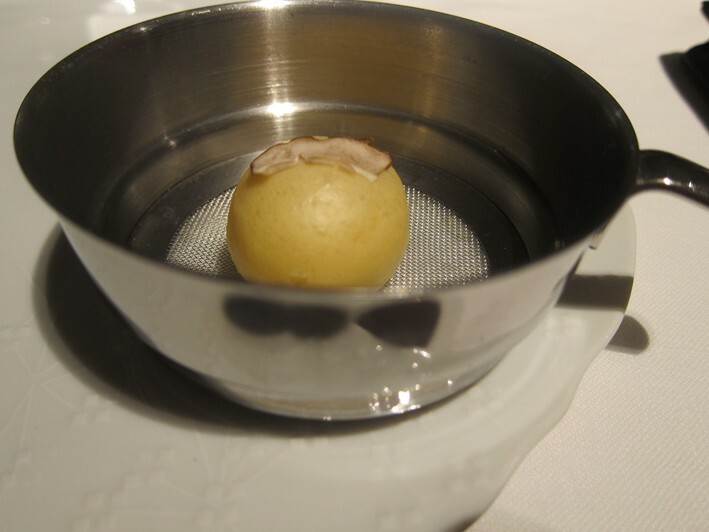 Next was an appetiser of mushroom brioche with hot meat consommé. The brioche had an incredibly light texture, a really remarkable piece of baking that practically melted in the mouth (20/20). Given the quality of the brioche, the consommé seemed merely pleasant, with fairly gentle taste and was not quite as hot as it might have been (16/20). This was followed by smoked caviar omelette, offered with a bonbon of pigeon liver with sherry spiced bread confit orange and pine nut cream. The rich liver flavour came through strongly and the omelette worked well (18/20). The breads were made from scratch in the kitchen here and were impressive. The tray had a selection of white bread, ciabatta, multi-grain, olive bread, a particularly fine apricot and nut bread, brioche of olive oil and tomato and also brioche of black olive. The breads had lovely texture, and the flavours came through really well (19/20 bread, with the apricot and nut bread faultless). 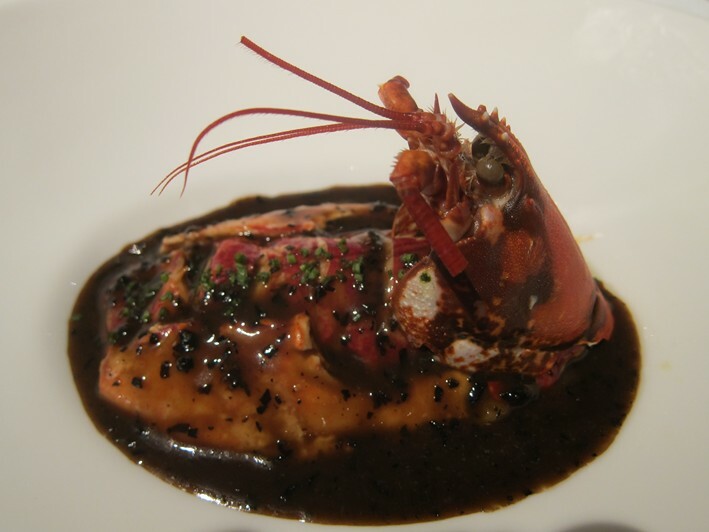 European lobster was very tender and had excellent flavour, served on a bed of absolutely superb mash with truffle, with a rich black trumpet mushroom sauce (19/20). I tried curry-smoked langoustines, which were beautifully cooked, served with a lovely sauce made from the head juices, onion and Comte cheese, which had a fairly subdued flavour, which in this case was just what was needed as it allowed the delicate flavour of the superb langoustines to really shine; my only tiny criticism is that the langoustines were not quite hot (still 19/20). 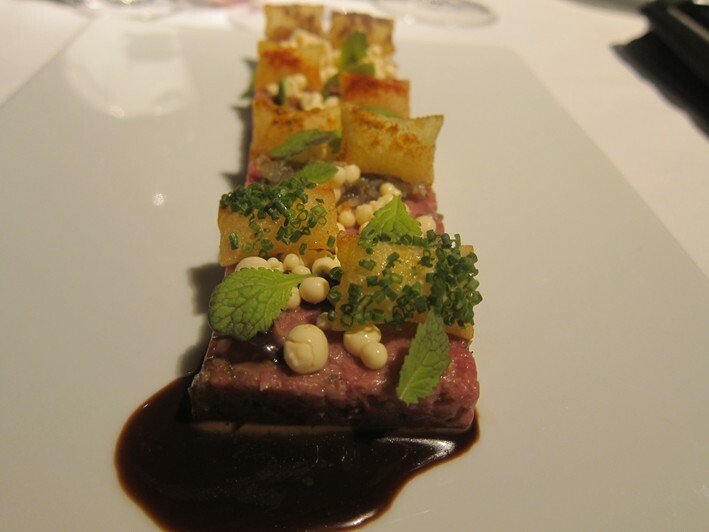 My main course was a veal steak tartare, using veal from Girona. This was served as a rectangular slab, on which were dots of mustard ice cream, mustard leaves, spicy tomato ketchup, caper compote, Sichuan pepper, a little lemon compote to provide acidity, praline cream and dried of Olorosso sherry, with a garnish of little fried potatoes and smoked paprika; this was finally offered with a little pool of meat béarnaise sauce. This complex set of flavour combinations was in terrific balance, the mixture of richness, acidity and spice just right, the fried potatoes providing a crunchy texture contrast, the meat itself of superb quality (20/20). 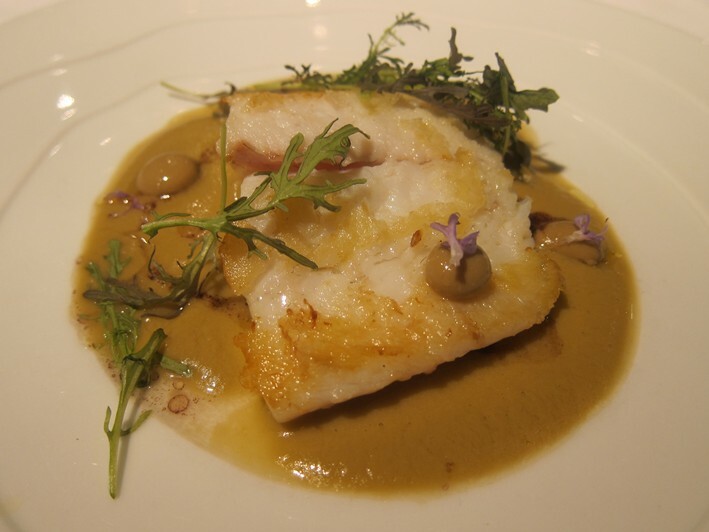 Fillet of turbot was simply cooked with an olive sauce garnished with mixed herbs and pickles. The fish itself was beautifully cooked and had superb flavour, but the sauce was slightly too salty (still 19/20 since the fish was faultless). 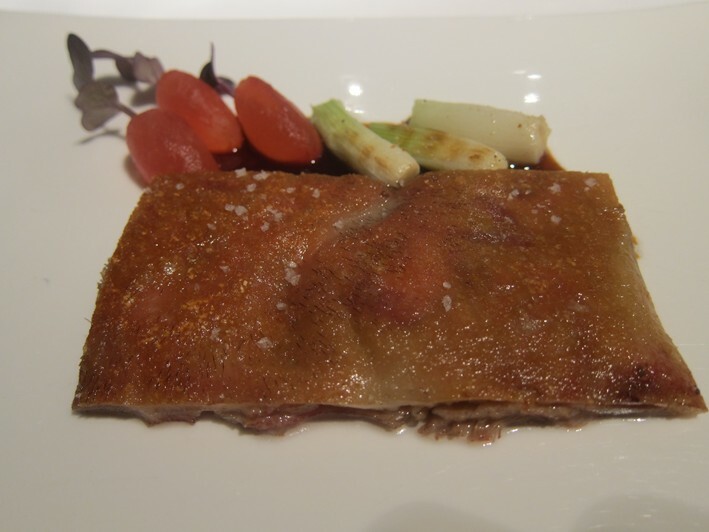 I then ordered an extra course of Iberian suckling pig with grilled baby onion, melon and beetroot, and meat sauce. The pork was magnificent, with crisp skin and moist meat, garnished with spring onion and with a rich sauce of the cooking juices (19/20). 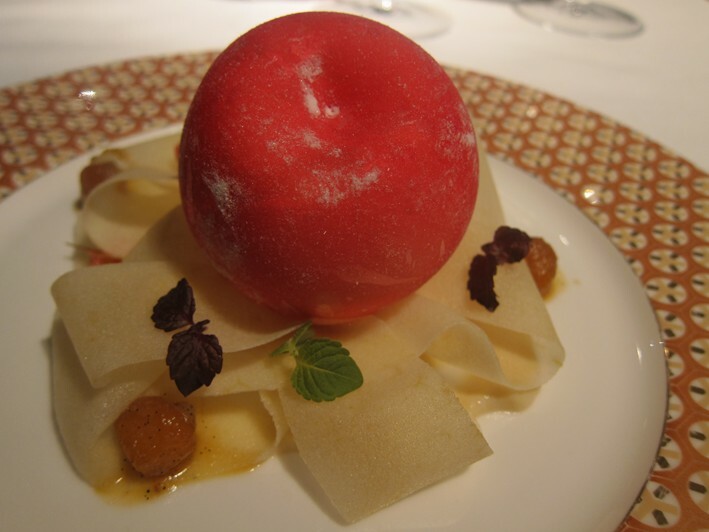 I had an excellent apple dessert, with apple in a series of styles and textures, with little leaves of crisp apple surrounding apple ice cream (19/20). 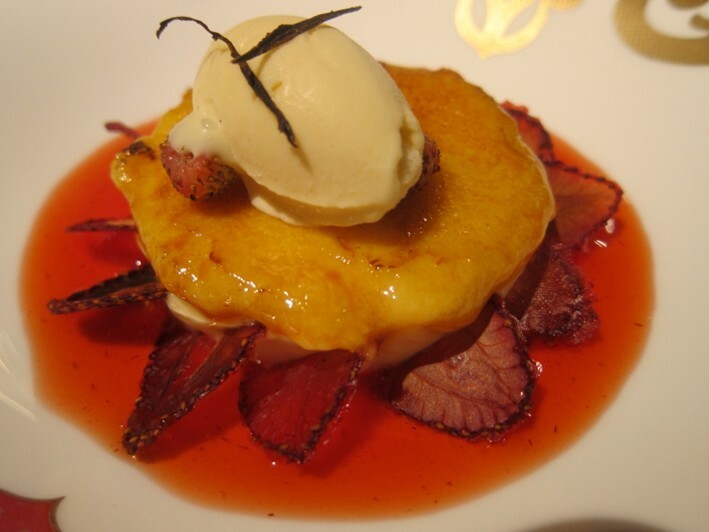 My wife ate Creme Catalan, which is essentially a Spanish creme brûlée, served with caramelised strawberries. This was creamy with a perfectly caramelised top, topped with wild strawberries, dried strawberries and strawberry syrup; this was simply magnificent (20/20). This was followed by very good coffee and a selection of petit fours. 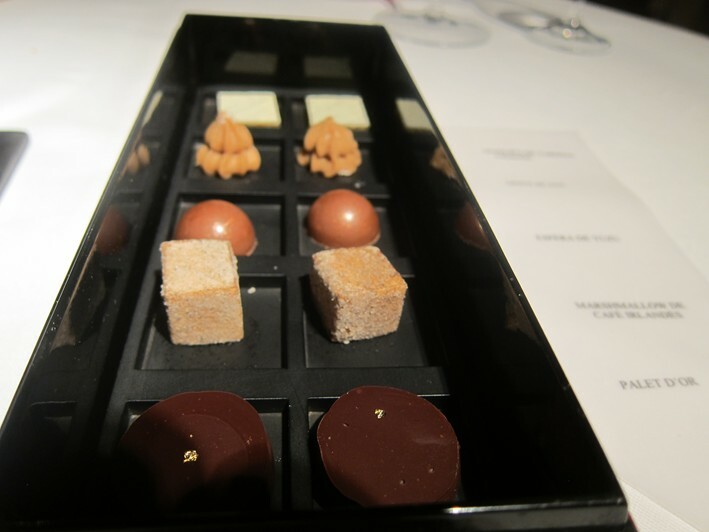 These comprised rich chestnut mousse, uzu in a chocolate dome, terrific mango marzipan, palet d'Or chocolate and, the only off-note, a rather odd marshmallow of Irish coffee. Overall 19/20 for the petit fours. The bill, even with superb wine and an extra course, came to €347 for two i.e. £151 a head. Mineral water was just €4 a bottle (compared to the €17 for the same water at one star First Floor in Berlin the same week). Coffee, even with these excellent petit fours was just €2.50. Restaurant owners across Europe could benefit from a hard look at their pricing of these ancillary items and explain to customers why they charge much more than this three star Michelin restaurant. Overall this was a superb meal, with terrific ingredients, high levels of technical skill on display, well judged flavour combinations and attractive presentation. Service was excellent throughout, helpful and highly professional. For me this is the best restaurant in Spain, and is one of the most fairly priced three star experiences anywhere in the world. Noting it’s been a while since Mr Hayler paid a visit and there being a long absence of comments I thought I’d add my two penn’orth. I’ve got to be honest and say expectations were very high when visiting this 3-star restaurant especially given that in some lists it now ranks amongst the top 3 in the World and even more so for being rated 19/20 on this very site, albeit over 7 years ago. The restaurant and dining room is as described and does nothing to diminish the anticipation. The welcome on the other hand was less impressive. Professional but impersonal, a theme that ran through the entire service. The basics covered but a hollowed out experience. 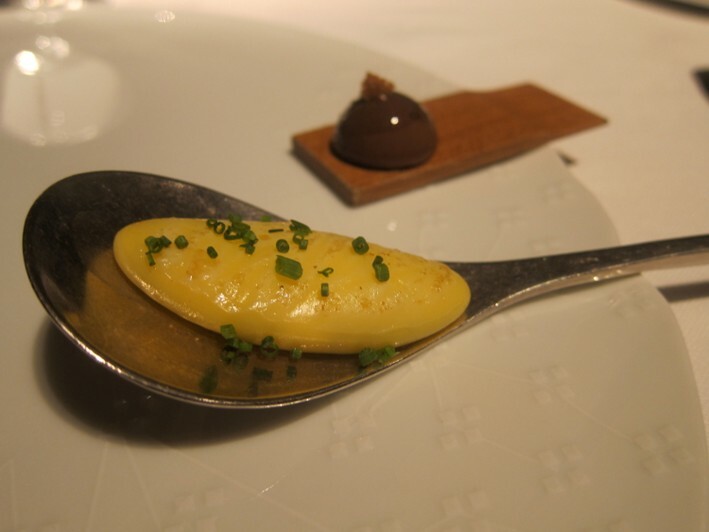 Service was at least swift which is essential when opting for the 15-course “feast menu” priced at €215. 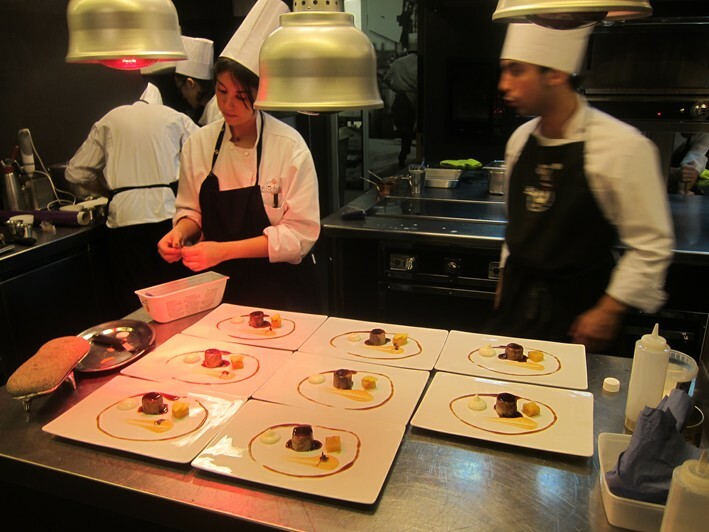 The 15-courses naturally excluded the amuse-bouche of which we counted 17 individual items! 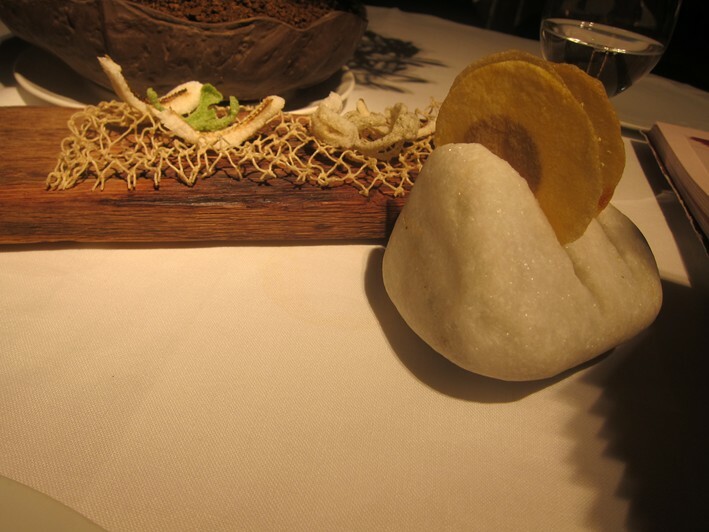 Spoiler alert: the amuse bouche were the only memorable components of the meal - at least for positive reasons! The presentation of the 17 snacks was excellent. Imaginative and impressive. The variety of textures and flavours was good. We were a party of 4. None of us found a course amongst the 15 that we would choose to order again, let alone one that wowed us. At best if we were to offer up a scale for evaluating the food, it would range from fair to highly unpleasant. The steamed mackerel was universally disliked. The sole-skin ravioli was similarly unpopular. I simply can’t pick out a highlight. The deserts were positively underwhelming. The ‘Girona Flower Time’ looked exquisite but didn’t deliver anything close to satisfaction. The final course ‘From Cocoa to Chocolate’ ensured the meal ended consistently - on a disappointing note. If I’m nothing else, I am a chocolate lover. This was not creative, perhaps dull, not tasty, perhaps dull. I don’t under-appreciate the effort and technique involved in creating the food on this menu, but if the culmination of all that work isn’t a meal that delights, let alone satisfies, seriously just don’t bother. When the service lacks any display of enthusiasm or passion you’re left feeling like you’re a victim of their success. Sucked in by the ratings and awards and spat out the other side after they’ve gone through the motions. I don’t often write reviews and I definitely don’t enjoy writing about bad experiences but this meal was so disappointing on almost every level that I had to get it off my chest! Top 3 in the World? 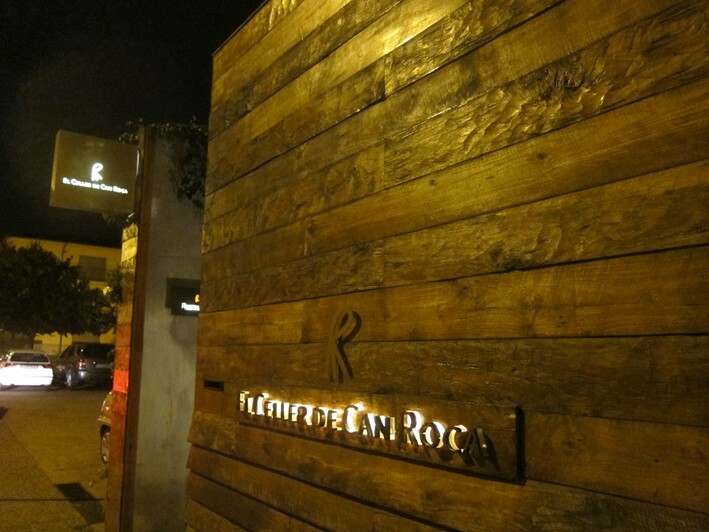 I can name 3 restaurants in my city that I’d rank higher than El Cellar de Can Roca. Notice there aren't any recent comments. We went May 21st, 2015. It was quite an experience - both the food and the wine. Also, given their current status, quite a bargain. We probably had 12+ courses, each paired with a special wine. Staff spent lots of time talking about both the food and wine for each course, which we really enjoyed. The tastes were all very intense and no two courses were at all the same. It was all perfectly orchestrated. I also got a tour of the kitchen which was fun. I think Andy needs to go back. I am sure it would get a 20 next time around. It was also really a bargain given what we got. Interested to read this review since I'm booked in for lunch in December. Can you tell us how you keep such accurate notes of courses served? 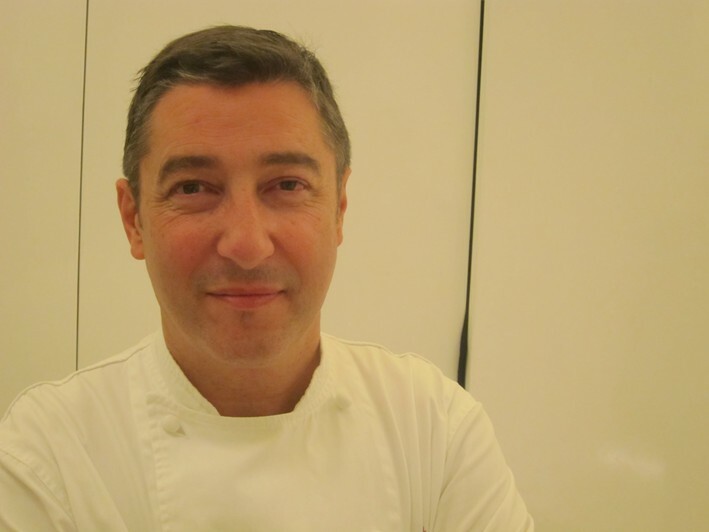 Do Can Roca offer a menu to keep?